Hamilton sitting behind an ambulance; in the white coat is Miss Ivens, the Surgeon-in-Charge at the Scottish Women’s Hospital at Royaumont. There is no shadow to chill our welcome to 1914. It is not only that the world is at peace, save for the civil war in Mexico; much more important is that it is actively seeking peace [CH’s italics]. […] There is a new and saner spirit abroad. It is visible in the happier relations which exist between this country and Germany, and not less in the remarkable movement for a real reconciliation between France and Germany. We can desire no better gift for the coming year than that it should strengthen this new spirit, and so hasten the time when the democracies of the three foremost countries of Europe, no longer estranged by the quarrels of diplomatists, will be united in a policy of external peace and internal reform. When that time comes we shall no longer waste our substance on the futile symbols of barbarism, but shall devote it to the task of adding to the wealth of life which is the only enduring bass of civilisation [quoted 95]. Hamilton notes that in the early 1930s there were attempts to say there had been no popular response to the coming of war. “Strange how devotees can ignore and forget!” (97). She refers to the shouting, to the queues of eager young men stretching down Whitehall. To those who have no memory of August ’14 it may seem incredible that one of the strongest impressions that remains with me is not only of good will but—in a sense—of peace! The peace that comes of fellowship in the face of common danger, and that means cessation of our daily snarling at each other. I remember my sense of surprise at the new curious atmosphere, the unity; and then realising that I ought to have expected it, since it is the instinctive custom of every organisation, every party, every cause, to quell dissension in its ranks by pointing to the outside enemy. Just as light needs shade to reveal its full splendour, so comradeship can only attain to full strength in the presence of its opposite—enmity. The beginning of a war, like the beginning of a strike, is a moment of exultant brotherhood (97). Her impulse to write stopped dead; the only thing that mattered was the news. A literary agent told her that he found it very difficult to get his authors to write anything in the last months of 1914. Hamilton turned down the offer of a theatrical tour in the USA, and instead went down to pick hops with her friend Edy Craig. Hamilton then offered her skills as a clerk and translator from French to the Scottish Women’s Hospitals. This was founded by Dr Elsie Inglis: they were to be war-hospitals staffed by women doctors. Many of those who worked for them were not Scottish. The British authorities were not enthusiastic, so units were placed at the service of the French, of the Balkan countries and even of Russia. In France, they were offered the former Abbey of Royaumont as their base, some thirty miles behind the trenches: Hamilton was established there by the end of November 1914. Hamilton worked at Royaumont from the winter of 1914 until Spring 1917. She wrote letters, in English and French; she kept accounts; occasionally she organised hospital entertainments. And she went to funerals. Once, near Beauvais, she witnessed a French medal ceremony: a father received a medal on behalf of his dead son, and a young woman put it on a handkerchief and covered it “as a priest might carry the Host”. “A junior once told me that “it was common knowledge in the hospital that you could always put Miss Hamilton in one of her rages by saying you hoped you’d get a medal” (111). Hamilton left the hospital in spring 1917 in the hope of joining the Women’s Auxiliary Army Corps. The WAACs were in the early stage of their existence, and she found it very difficult to establish what she would be paid, though she did discover that she would have to pay “what for me was a considerable sun” for her uniform. She decided instead to join an organisation run by Lena Ashwell called “Concerts at the Front”, which ran entertainments for the troops. So it was in that capacity that I again crossed the Channel from Folkestone to Boulogne; wearing not the khaki of the Women’s Auxiliary Army Corps, but the grey of the Y.M.C.A.—the Y.M.C.A. being responsible to military authority for the lodgement, general care and good behaviour of the Lena Ashwell parties (131). She was based in Abbeville, where the YMCA had a number of huts, and where those who worked for the YMCA were put up in houses leased from their French owners. Her own house was demolished by a bomb at one point, and from then on the civilians camped out in the hills above Abbeville. It was then, it seems, that she began to think of what became her 1922 science fiction novel. She wrote, at the time, about how air-power had changed warfare. And this, one realised, was only the beginning of air-power and the need for invisibility that air-power imposes; what we saw was but a promise of terror to come, a foreshadowing of full-grown achievement. Lying on the hillside one glimpsed something, at least, of the chaos of full-grown achievement. The chaos of a people, an industrial people, driven out of its towns and kept out of them; not returning, as we did, in the comparative safety of daylight but—by days of continuous raiding—kept out of them. And not only kept out of them, but kept on the run; driven hither and thither, reduced to starvation and savagery (148-149). This realisation changed her whole attitude to the war. When you have once accepted the more than possibility that your civilisation is headed for destruction, it is almost inevitable that you will slip into indifference towards many ideas and interests and activities that would otherwise have seemed to you important (151)… Unless we can master the air-menace, the city, as we know it, is bound to go; on the day the first aeroplane rose from the ground the foundations of every city in the world were shaken… Curious to reflect that when I was young no one would have dared to suggest that a indiscriminate massacre was permissible as a weapon of war, whereas now we take such massacre for granted (152). She mused over this question of the return of barbarism, and began to wonder that maybe there have been civilisations in the past that have been destroyed. Maybe dragons were a distant memory of machines? I could not part company with the idea of disaster through science, recurring disaster; it haunted me, suggesting possibility and detail, until it set me to work on a book. This was twice published, under two different titles; first in 1922 as Theodore Savage, secondly a few years later, as Lest Ye Die. It dealt with a certain Theodore Savage who was bred to the life civilized and, surviving ruin, saw the beginnings of the new life barbaric. Not what is known as a pleasant book, or the kind you expect a library public to clamour for; but I honestly think I put good work into it, and I know that many of those who did read it were impressed by it; every now and then I get letters from readers who tell me that they have never been able to forget it, and that the idea of science as destroyer haunts them, just as it has haunted me (155-56). At this time she might have been thinking about Theodore Savage, but she was actually writing her first Great War novel, William, an Englishman, which came out in 1919. It was a story of the doomed love of William and Griselda, both of whom die in the course of the war. A review in The Englishwoman called it a masterpiece, written “out of a great pity, a great love, a deep indignation, and a white-hot righteous anger” (quoted Whitelaw 164). 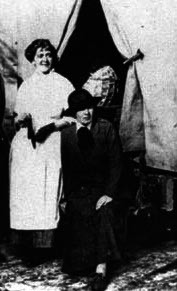 Hamilton left Abbeville in 1918, and worked in Winchester, where Lena Ashwell was running entertainments in the town and in the surrounding camps. Many Americans passed through the area before sailing to France from Southampton. In October 1918 Hamilton heard of the death of her youngest brother. He had joined in New South Wales, where he was when the war broke out (he had been sent out to Australia at 16), and was killed in the advance at the end of the war. Cicely and her sister were in London on 11 November 1918. Looking back at that uproarious moment what I see most clearly is the façade of the Hotel Cecil—hotel no longer, but a warren of government offices. At every window of those government officers excited government employees who all of them were throwing out sheets of paper—the taxpayers’ foolscap—which fluttered down on the crowd in the manner of an outsized snowstorm. Paper was scarce then, and paper was expensive, but what did it matter—we rejoiced! … That was all I saw of the Armistice alarums and excursions; the mafficking at night I had no mood for (158). In the early part of 1919 Hamilton returned to France, with a repertory of one-act plays, for the benefit of the troops still there. She was in Amiens when the sandbags protecting the medieval Christ statue were taken away: “I watched while its beauty was revealed” (159). She walked through the Devastated Area where the trenches had been: warily, in case some shell or bomb was hidden in the soil. The actors played for troops; though sometimes German prisoners-of-war were let in to the back rows. It was against regulations, but the officer in charge said “unless we’re tactless enough to turn round and investigate, we can’t see what’s going on at the back of the hall” (164). While in the Devastated Area she went to see her brother Raymond’s grave, and was convinced that she had felt his presence. From the Devastated Area, “our little company of players” moved into the occupied territory, and performed in the Cologne area. She attended the opera in Cologne, where the British and German parts of the audience were separated as much as possible, but nevertheless there was “a genuine peace to which both sides submitted in willing agreement; and a genuine internationalism, spontaneous and unconscious, born of a common enjoyment” (176). On 14 July 1919, Paris celebrated the signing of peace, and Mainz (under French occupation) did as well. But the British area (Cologne and Bonn) largely ignored it. However, Hamilton was in Bonn, and she heard guns going off at midday. A German gentleman asked her what it was for, and she said that the British were celebrating peace. He asked her how to pronounce the name of Lloyd George properly, so that he and his friends could celebrate too, and drink his health. The novel that had been inspired by her experience in 1918 was published in 1922. Theodore Savage: The Story of the Past or the Future (London: Leonard Parsons, 1922) is astonishingly bleak. It starts in a timeless world in which Theodore Savage gets in with his normal life in the Civil Service in London. The League, which either is the League of Nations or intended to recall it, is trying to keep the peace, but Karthania is being aggressive. War starts; young men queue up to enlist; Savage is kept busy in the Distribution Office, preparing to be put on a war-footing. He is transferred to York, and is there when the bombing begins. Refugees flee to Yorkshire, and the distribution system breaks down, in the wake of the breakdown of the transport infrastructure. It amazed him looking back, to realise the swiftness with which ordered society had crumbled; laws, systems, habits of body and mind—they had gone, leaving nothing but animal fear and the animal need to be fed (86). Each locality began to look after itself, and tried to shut out the tide of refugees. Plunderers were strung up on trees. Savage, now in Ripon, could see the flames of York; then his own camp was destroyed, and he becomes a vagabond. Eventually he joins a small tribal community, and, at the end, dies. With his death the local legends increased and multiplied; the distorted, varied myths of the Ruin of Man and its causes showing an inevitable tendency to group themselves around one striking and mysterious figure, to make of that figure a cause and a personification of the Great Disaster. Theodore Savage, to those who came after, was Merlin, Frankenstein and Adam; the fool who tasted of forbidden fruit, the magician whose arts had brought ruin on a world, the devil-artisan whose unholy skill had created monsters that destroyed him. His grave was an awesome spot, apart from other graves, which the timorous avoided after dark; and, long after all trace of it had vanished, there clung to the neighbourhood a tradition of haunting and mystery … To his children’s children his name was the symbol of a dead civilization; a civilization that had passed so completely from the ken of living man that its lost achievements, the manner of its ending, could only by expressed in symbol (last paragraph, 319-320; her ellipsis). Page numbers, unless otherwise indicated, all refer to Hamilton’s autobiography, Life Errant (London: J.M. Dent, 1935); I have also used Lis Whitelaw, The Life and Rebellious Times of Cicely Hamilton (London: The Women’s Press, 1990).